Exploring Our Fluid Earth is based on the nationally recognized Fluid Earth/Living Ocean (FELO) aquatic science curriculum (Klemm et al., 1990; Klemm et al., 1995). The Exploring Our Fluid Earth curriculum is grounded in the inquiry approach to learning and examines marine and freshwater systems of the earth by studying the influence of water on the planet. The Exploring our Fluid Earth modules comprise the essential elements of a year-long course in marine science at the middle and high school level. Modules focus on the physics, chemistry, biology, ecology, and technology of aquatic systems and on the researchers who study them. Each module comprises a series of related lessons that build conceptual understanding. The integration of disciplines provides multiple entry points to the curriculum materials, which teachers can approach from the perspective of their respective disciplines. The modules also provide a unique opportunity for subject area teachers (i.e. biology, chemistry, physics) to utilize portions of the curriculum in their teaching—to teach their course concepts in the context of the aquatic environment. Exploring Our Fluid Earth is organized into six modules. Each module is further divided into units and then into topics. Each unit contains media resources, activities, questions, special features, and teacher resources for use in the classroom or in informal education settings. Images, video, and online links help connect Exploring our Fluid Earth to current topics. Activities are an integral part of the Exploring our Fluid Earth curriculum. Activities scaffold to build content knowledge within units, and it is through the activities that students construct their understanding of the concepts. Questions include question sets, which address topics covered in the module text, as well as further investigations, which expand on topics covered in the text and provide suggestions for more in-depth discovery and research. Activities also include questions that directly address the content of the activities themselves. Throughout the Exploring our Fluid Earth modules, students will investigate, discover, evaluate, and communicate about aquatic science issues. The special features help connect the curriculum concepts to the real world and to the process of doing science. There are several categories of Special Features. 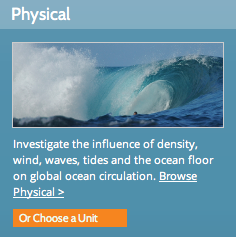 These features connect ocean and climate processes to relevant concepts. These features show differences and similarities between concepts and their application. These features explore the practices of science, which include the processes that scientists engage in as they investigate the natural world. The word practices emphasizes that doing science is a combination of both knowledge and skills. These features also explore the customs, traditions, language, and values that make up the scientific discipline. These features take a closer look at the people doing science and at current scientific discoveries. These features explore historical and current practices of investigating the natural world that are grounded in cultural perspectives. These features highlight strange and interesting facts, practices, and anomalies of science, scientists, and the natural world. Teacher text resources include background content information and resource links for topics covered in the Exploring our Fluid Earth curriculum. Teacher activity resources include background information as well as suggestions for classroom implementation, including supply needs, activity extensions, and activity modifications. Exploring Our Fluid Earth forms the curriculum base for the Curriculum Research & Development Group (CRDG)’s professional development series in Teaching Aquatic Science as Inquiry (TSI Aquatic). The central premise of TSI is that learning, including that done at the professional level, is best accomplished through authentic application of knowledge and skills. Through TSI, teachers learn to help students understand not only basic scientific concepts, but also the process used to gain and refine those concepts over time. Teachers learn to help students evaluate and decide which tools and techniques to use, and teachers are encouraged to provide students the opportunity for social interaction, within the context of science, both inside the classroom and beyond. Teachers are both pedagogical experts and learners. 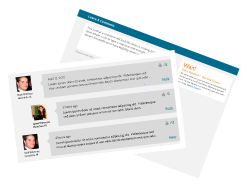 The Exploring Our Fluid Earth online community provides the capacity for teachers to share material and reflect together on their professional practice. By becoming part of the learning community, educators become members of the Exploring Our Fluid Earth aquatic science education network. In this way, educators can build a network of practitioners engaged in applying new pedagogical knowledge to improve inquiry and aquatic science teaching practice. Teachers participating in TSI professional development programs provide valuable feedback on the Exploring Our Fluid Earth curriculum materials. This feedback is used to update the text, activities, and teacher resources. TSI pedagogical materials and announcements about workshops, opportunities, and events can be found in the professional development portion of this website. The Exploring Our Fluid Earth curriculum has a rich classroom-tested research history from the Fluid Earth/Living Ocean texts (Klemm et al., 1990; Klemm et al., 1995). The current Exploring Our Fluid Earth curriculum and website are undergoing an extensive, iterative process of research, evaluation, and revision to study the implementation of the curriculum and the effects of the curriculum on students’ learning. Members of the Exploring Our Fluid Earth curriculum community contribute to the research effort and improvement of the final product. Exploring Our Fluid Earth, a product of the Curriculum Research & Development Group (CRDG), College of Education. © University of Hawai‘i, 2019. This document may be freely reproduced and distributed for non-profit educational purposes.